The genesis of the Flying Machine Arena (FMA) can be traced to various research projects that date back to the 1990s. The system architecture for the FMA, for example, is the same architecture that was used for Cornell University’s Robot Soccer Team in 1998. Founded by Raffaello D’Andrea, the Cornell team featured vehicles with rudimentary local intelligence, an overhead vision system (which acted as a surrogate for GPS), a high-performance workstation for implementing computationally intensive tasks such as path planning, and a wireless link for sending commands to the vehicles. After Cornell won the 1999 RoboCup competition in Stockholm, D’Andrea and his research team began to explore the possibility of extending the system beyond the soccer pitch and into the third dimension. Despite lacking essential technology for conducting this kind of research, they built a series of high-performance aerial vehicles, developed systems to track and control them, and made plans to construct a test-bed in which to house it all. 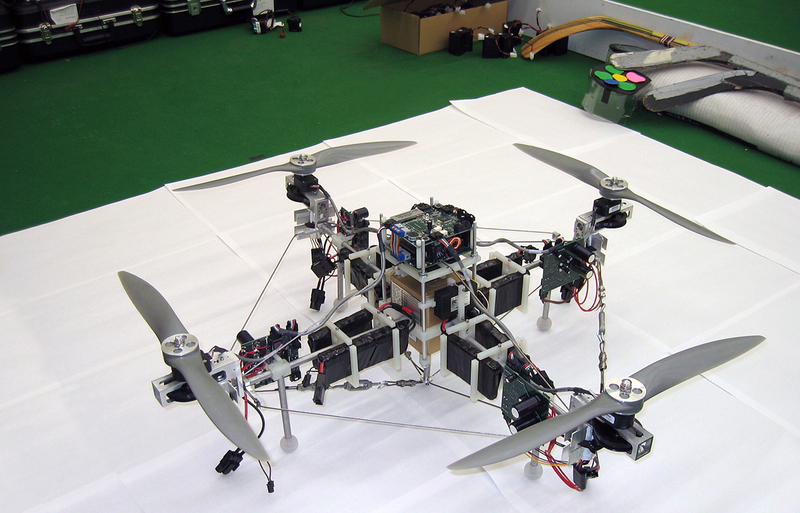 In 2000, they built a quadrocopter prototype, mounted LEDs on it, and used three cameras to determine the vehicle position and attitude. Engineering student Andy Eichelberger developed the first version of the system as part of his Master of Engineering degree, which was then refined and used by Matt Earl as part of his PhD thesis. 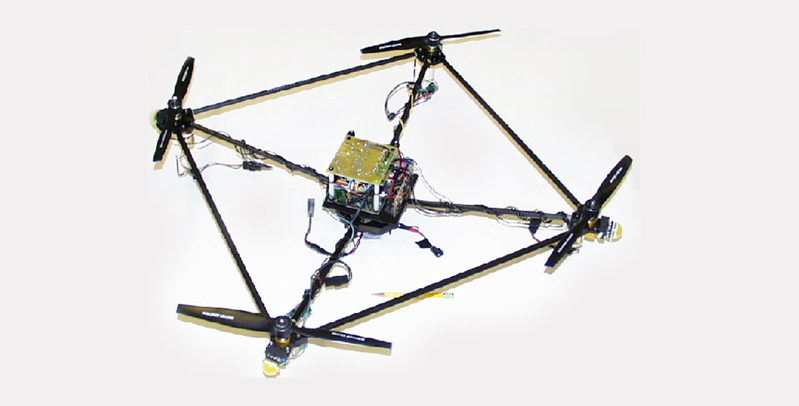 In 2002, Master of Science students Eryk Nice and Sean Breheny began to build a high performance quadrocopter, which was then used by Oliver Purwin for his PhD research. With propellers that were each 45cm in diameter, this vehicle was much larger than the first one, and could consume over 4000 watts of power at peak thrust. The vehicle’s high performance inertial measurement unit (the gold box in the middle of the quadrocopter) weighed more than 1kg, and was responsible for driving the vehicle’s size requirements. 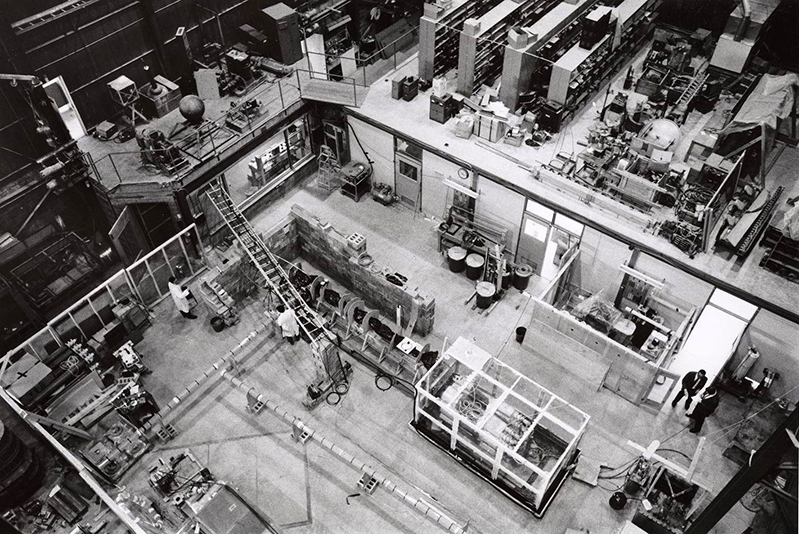 In 2003, D’Andrea’s research team at Cornell received approval to convert the university’s High Voltage Laboratory – an empty 15,000 square foot building with 50-foot ceilings – into the Cornell Laboratory for Intelligent Vehicles. The goal was to transform the space into a test-bed for high performance air and ground vehicle control. At the same time, however, D’Andrea began a sabbatical to co-found Kiva Systems with partners Mick Mountz and Peter Wurman, and as a result the plans were abandoned. It has since become a large space for student projects. Five years later, at the end of 2007, Kiva Systems was well on its way to becoming a successful robotics and logistics company, and D’Andrea decided to rejoin the academic world at ETH Zurich. The conditions for his appointment were predicated on the construction of a large, indoor space for flying vehicles: the Flying Machine Arena.